Reports of voters being turned away because they declined to check a box asking them to verify U.S. citizenship have been coming in from several areas of the state. Other political groups received calls from voters complaining they had been refused the right to vote after declining to check the citizenship box. Secretary of State Ruth Johnson, a Republican and former Oakland County clerk, added the citizenship question to ballot applications in the February presidential primary election, saying her role as chief elections officer gave her the authority to do so. In July, Gov. Rick Snyder vetoed a bill that would have made Johnson's citizenship policy state law. The Republican governor said the requirement could confuse lawful voters. There have been reports of "untold numbers of people being turned away from polls" today because they refused to answer the citizenship question, according to Senate Minority Gretchen Whitmer, D-East Lansing, who blasted Johnson for keeping the policy after Snyder vetoed the bill. "Johnson's actions as our state's top elections official are disgraceful," Whitmer said in a statement. We are still getting calls in to 866-OUR-VOTE about eligible voters being turned away or having to argue with poll workers in order to get their ballot. This entire mess could have been avoided had the SOS simply followed the law and worked with voters ahead of time to address this confusion. State election officials sent instructions to election clerks today after at least one person was illegally refused a ballot. When Rich Robinson went to the polls in East Lansing this morning, poll workers refused to give him a ballot because he would not check a box declaring he was a U.S. citizen. Checking that box is not required under law. Robinson works for the Michigan Campaign Finance Network and is familiar with election law. He says he wonders how many others are being denied the right to vote today because local election officials are misinformed. “If the information couldn’t travel accurately five miles down Michigan Avenue from the capitol to the East Lansing City Clerk, what’s going on in Ontonagon or Monroe or points in between." 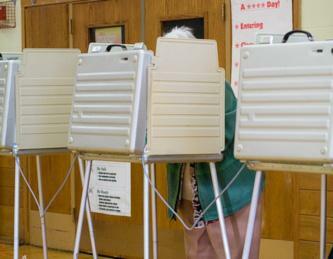 East Lansing City Clerk Marie McKenna says the state emailed local officials just before noon, clarifying that people who refused to check the citizenship box are eligible to vote, but the election officials had to inform them they must be citizens. “We’re to read the statement: ‘Under the Michigan Constitution and election law, you must be a citizen of the United States in order to vote.’ And then we issue the ballot to the voter." McKenna says she’ll visit all her precincts today to make sure election judges understand what to do. A voter in Oakland County also complains there is rigid citizenship screening occurring there.